I created this map because I wanted to visualize the 2016 U.S. presidential election in a way that we’re not used to seeing it. This is the kind of map that we’re perhaps most familiar with, and which President Trump is reportedly very fond of. It is a simple map that shows counties as either blue or red with really no other information. I believe that this kind of map leads to some widely-held misconceptions on both sides of the political divide. One of those misconceptions comes from some on the right, who look at that map and see a sweeping mandate for their candidate. 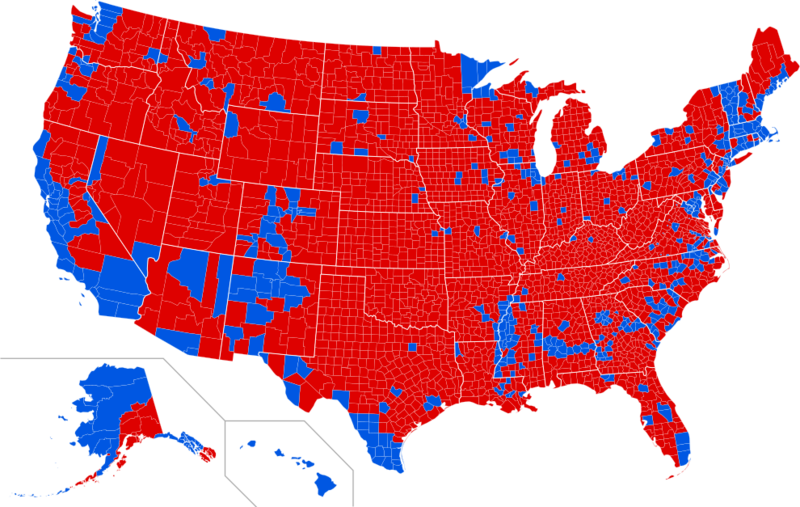 I mean, look at the enormous sea of red that is America, with little blue islands clinging to existence. Of course, the common response from the left to that interpretation is that “land doesn’t vote, people vote,” which, despite the fact that the Electoral College system does give more power to voters in low-population states, still holds largely true. The implication of that response is that those enormous swaths of red are devoid of population. Is that really true, though? While “Red America” accounts for 74% of the land area of the U.S., it only accounts for 46% of the population. This gives “Blue America” a population density over three times greater than that of Red America (184 persons per square mile vs 55 persons per square mile). However, we’re not talking about the difference in population density between, say, New York City and Idaho here, but more like the difference between Indiana and Iowa. This misconception is aided by the fact that it is easy to look at the simple red/blue map and pick out major cities. Anyone familiar with the geography of Texas, for example, can look at that map and easily pick out the major cities of Dallas, Houston, Austin and San Antonio. It would be easy to reach the erroneous conclusion that “urban areas are blue and rural areas are red.” However, this ignores the the fact, demonstrated by the map I’ve created here, that, in most of the U.S., suburban areas lean Republican. Let’s take Dallas for example. While Dallas County is certainly blue, it might be an oversimplification to just say that “Dallas is blue.” If, when you say “Dallas,” what you really mean is the Dallas metropolitan area, that is. With over half of Americans living in suburbs, referring to a city by name these days, more often than not, refers to the central city and its suburbs. Blue Dallas County, while the core county of the Dallas metropolitan area, only constitutes 36% of its population. Neighboring Tarrant County (home to Forth Worth) and all of the suburban counties surrounding Dallas and Fort Worth are red. So… is Dallas really “blue?” The Dallas-Fort Worth metropolitan area certainly isn’t. The same pattern shows up all over the country (with the notable exception of the West Coast). What we find is that the Republican heartland, contrary to what some on both sides of the aisle would have you believe, is not the farmland and wilderness of the American interior. It is not even necessarily the Rust Belt and Coal Country. Rather, it is in suburbs and mid-sized cities. Hopefully this map provides a unique perspective of where voters actually live and how they vote. *Notes: ‘Voter Density’ is the number of votes cast (for any candidate) per square mile. Election data comes from [Townhall.com](https://townhall.com/election/2016/president/) and [RRH Elections](https://rrhelections.com/index.php/2018/02/02/alaska-results-by-county-equivalent-1960-2016/).